When a tooth has a minor chip, crack, discoloration, or decay, dental bonding can be a simple way to cover these flaws. The bonding material is tooth colored that completely blends with the rest of the teeth. By being white, these dental fillings restore and mimic the natural appearance of tooth structure. They may be used on front and back teeth without compromising esthetics or strength. A crown is a “cap”, that is tooth shaped. It is placed on top of a tooth to restore its function, shape and size as well as improve aesthetics. Dental bridges are permanent dental appliances made to replace missing teeth. These bridges can be supported by natural teeth or created with implants. It is important to create a bridge when you have missing teeth, to prevent shifting of the natural teeth. Bridges are natural looking, allow for comfortable chewing and can be easily cleaned and maintained. During the first appointment, the tooth is prepared and shaped. An impression of the tooth is taken and a temporary crown is placed. The impression is then sent to a dental laboratory to fabricate a custom designed crown. At the second visit the dental crown, and/or bridge is cemented and the procedure is complete. It is very important to take good care of the crown of bridge with proper brushing and flossing. 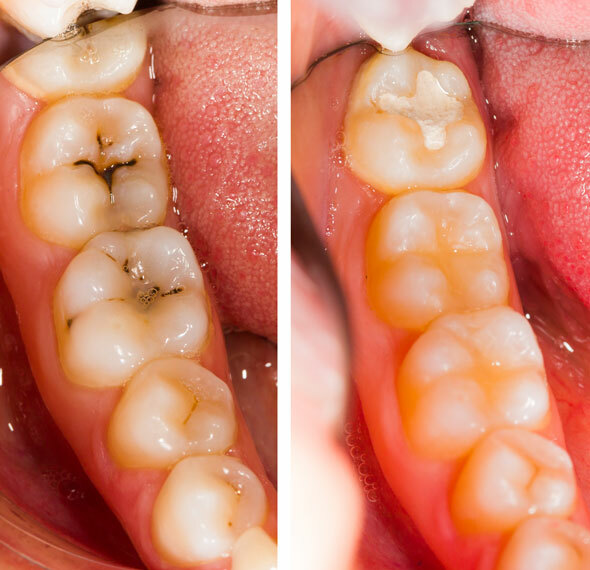 A quality crown or bridge can last many years. If you grind your teeth, your dentist may recommend a mouth guard to protect your new crown and the rest of your teeth. Placing an inlay or an onlay may be necessary if the tooth is damaged to the point of not being a candidate for a filling. By placing an inlay/onlay, this will eliminate tooth sensitivity in the decayed tooth, and will reduce the likelihood of losing that tooth. An onlay restores a large area of a tooth, while an inlay lies inside the tips (cusp) of the biting surface of the tooth. Inlays and onlays can be placed when teeth are cracked or are chipped. Inlays and onlays are laboratory-processed ceramic restorations manufactured to match the natural color of the tooth. Inlays are approximately filling size without the inclination to break-down over time the way a traditional amalgam filling does and are cemented in place. Onlays are more conservative than a full coverage crown.